-One Carabiner: $12 - (5,600lb MBS) -Gold screw lock carabiner made from zinc plated alloy steel. 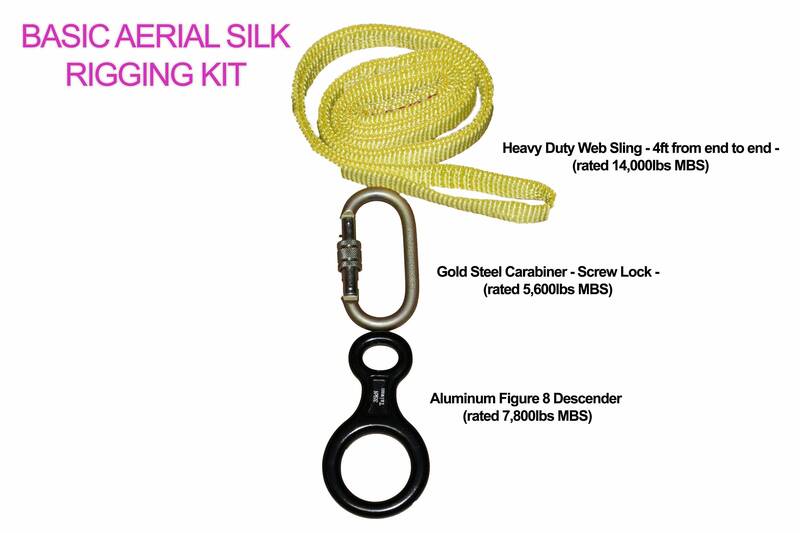 -One Figure 8: $15 - (7,800lb MBS) -This 8-ring is smaller and more compact than the traditional rescue 8 but boasts an even higher strength rating! Made from aluminum and has an anodized black finish! This ring is perfect for the travelling aerialist and is my favorite style to use. -One Heavy Duty Web Runner: $15 - (14,000lb MBS) -Our most popular and strongest runner. Made with a yellow outer layer and a bright orange inner layer to help reveal any damage due to fraying/wear and tear. If the orange is visible then runner needs to be replaced! This is a great way to help ensure your safety! -One Swivel: $65 - (9,000lb MBS) -Triangular red and blue this swivel is made with a sealed ball bearing to help keep it running smoothly for years! 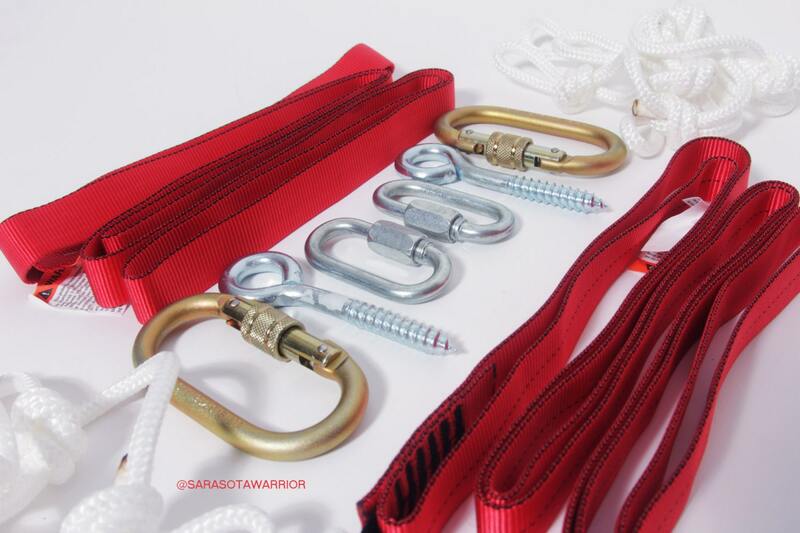 -Two Carabiners: $24 - (5,600lb MBS) -Gold screw lock carabiner made from zinc plated alloy steel. 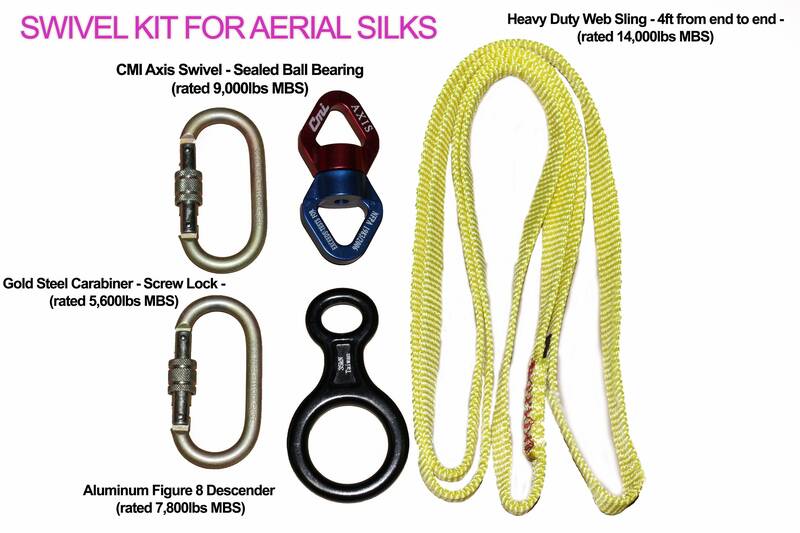 -Two Web Runners: $12 - (6,000lb MBS) - Made from 1 inch black tubular webbing. This runner is 4ft from end to end. -Two Steel Quick Links - $5 - (1,550lbs MBS) - These are small screw lock links designed to connect your webbing to your daisy chains. -Two Daisy Chain: $50 - (3,400lb MBS) -I'd like to say these are the best daisy chains I could find to provide to you! 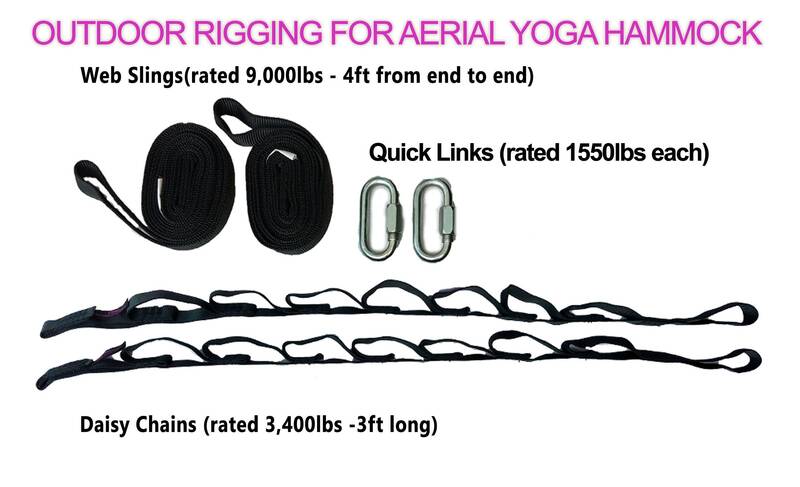 They have the highest breaking strength that I know of for daisy chains and are a sure/safe bet for aerial yoga! They are black and run 3.5ft from end to end. -Two Eye Screws: $3 - (250lbs MBS) - Screws are for wooden beam installs and NOT for professional use. They will hold up nicely for gentle aerial yoga practice but NOT for drops or intense circus activities. 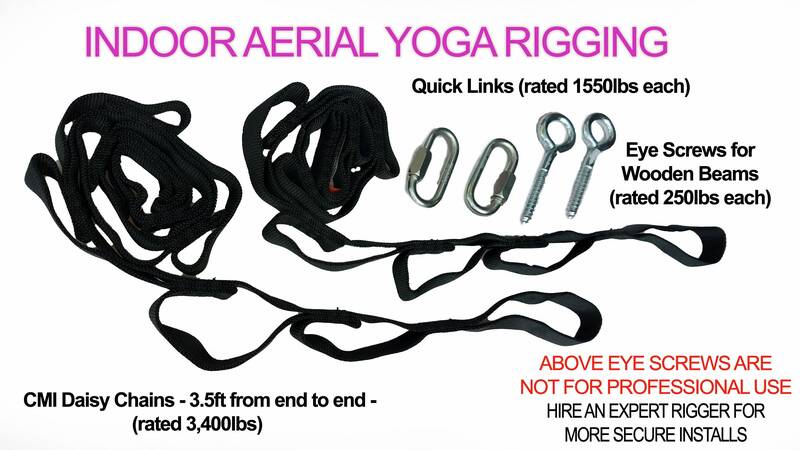 I much prefer you hire a professional rigger for a home install but I know of many people who use these so at least want to provide the correct kind for those who plan on installing this way. Great quality as well! The seller helped with all my questions & was sooo sweet. She provided me with an amazing, sturdy & very durable product! Very satisfied!